“Design Thinking” unlike analytical thinking is a process for creative problem solving that looks for an improved future result by combining empathy, creativity and rationality to meet user needs and drive business success. Martin feels that todays business problems begin in the school system. We are taught early on that there is one right answer and wrong answer and not the possibility of many answers or a combination of solutions. Rotman is now testing a program to bring this new thinking style to high school students. They began recently with a grade 10 class and found that the traditional model is already too ingrained at the grade 10 level. Next they will try it with grade 7 and 8 kids. 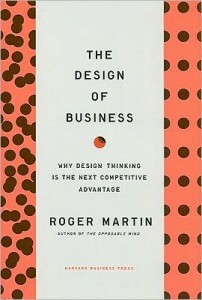 It seems to me that a world using “Design Thinking” to solve its problems might just be a better place for everyone! Should We Settle for Intuition? My wife and I are firm believers in learning for learning’s sake and NOT for the grade. We challenge our boys to discover new ways of approaching problems and learn from the process of problem-solving which will help in finding solutions to future problems, no matter the subject. I grew up in a school system that pushed for the best grade you could get. As a “hands-on” type of learner, I found my educational experience very frustrating. It wasn’t until my college engineering courses, where I was actually problem-solving through experimentation, that I found a love for learning for learning’s sake. I am very interested in hearing more about Rotman’s test with 7-8th graders.